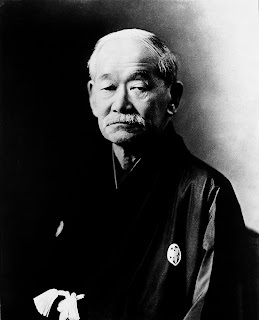 Most judo clubs have a picture of the founder, Kanō Jigorō (28 October 1860 – 4 May 1938), close by the practice area. It is supposed to hang on the front wall. 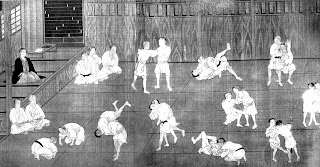 That is, the wall you face when entering the dojo, called the shōmen (front wall), or kamiza (high seat). 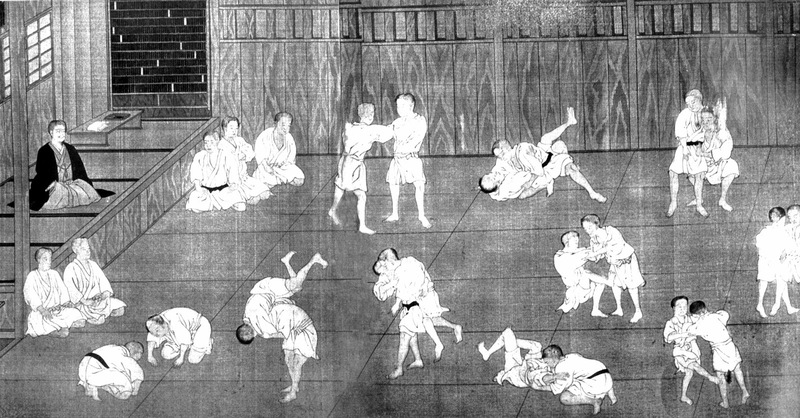 The latter because before the advent of the picture that was where the head of the dojo would sit, and over-see practice (As in the below illustration by Shuzan Hishida). In Bergen the picture had gone missing, and in Uppsala it is a framed but dilapidated poster. Anyway, I decided to get a new one, but quickly found out that it is all but impossible. As a photographer, and, if I say so myself, not a bad printer, my next thought was to find a picture online and print it. 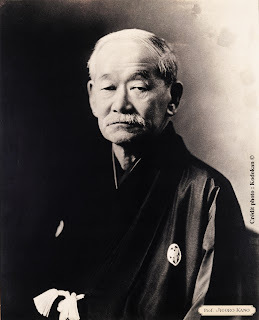 This is the story renovating a scan of an old Jigoro Kano portrait for printing. Luckily, by Japanese law any photographs taken before 1946 are part of the public domain (or that is what Wikipedia says). When working with a picture you obviously want to start with the highest possible quality and resolution, and with a bit of work I found this rather good scan at 3543x4375 pixels (click on the picture to go to the original URL). It is only a j-peg but with that kind of resolution you can do a lot without destroying it. This is good because there was a lot to be done. There are scratches that seem to be from the original photograph, including one prominent on his left eye-brow. There are some blotches on the background, and I do not want the text or the old name-badge. Finally, it is made from an old tinted photograph, and I don't like the tint. So, I loaded the image into the old editor, i.e. Adobe Photoshop, and cleaned it up. I tried to upload the actual TIFF to Wikimedia-commons, but that didn't work so I have just uploaded the final j-peg. If I find another place to put the layered file I will, and then you can easily adapt it to your needs. It prints quite well up to A3.